Royal wedding mania has almost reached its saturation point. However here at Stylewhisperings we’re still in wedding style mode. Now that the big day is over it’s time to take inspiration from what was one of the most anticipated red carpet-esque events of the season. I think we can all admit that wedding wear can be a tough one to get right. While we all love getting our glad rags on, it seems that when it comes to dressing for a wedding our sense of style can be lost. This is where, dare I say it, the boring yet safe summer shift style dress comes into play. And it seems us mere mortals aren’t the only ones privy to taking the safe option. Let’s take Pippa Middleton’s mint green dress by London-based brand The Fold. It was perfect for blending into the background of a garden party. This was obviously one wedding where Pippa decided not to steal the show. Instead it was the American’s who took centre of the style stage. The Suits ladies took to the avenue like it was their own personal red carpet. This is how wedding wear should be. Actress, Abigail Spencer brought the polka dot trend to the fore without losing that wedding wear chic. This 1930’s style Alessandra Rich dress stood out for all the right reasons. 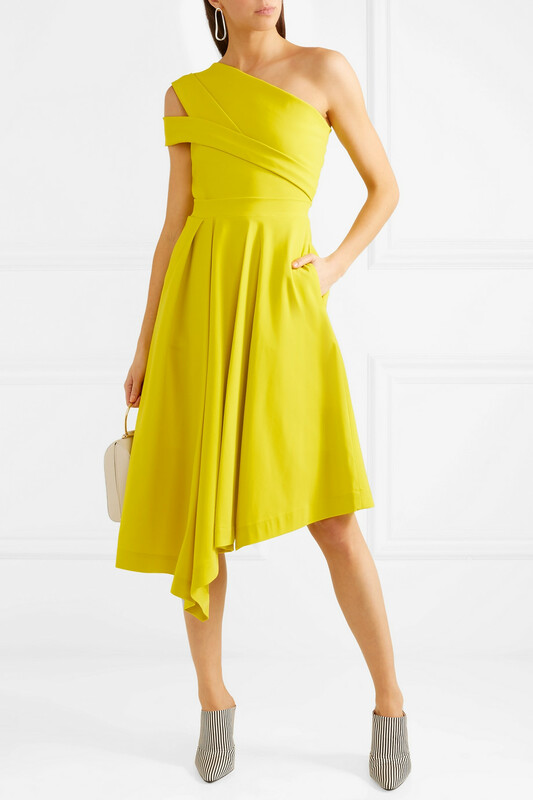 As did, Amal Clooney’s, Stella McCartney dress. There is no denying that yellow is a tough colour to pull off but Amal did so with ease. The cut, the structure, the very fitting English mustard tone all worked impeccably. So unless you’re auditioning for an actual part in the Royal family then I say it’s time to ditch the shift. Bring some of your personality back into wedding wear. Taking inspiration from the ladies that shone bright this weekend, I’ve compiled just a few of my wedding wear favourites. It turns out sequins are not just for Christmas. This season sequins are sparkling in the summer sun, so embrace a sprinkle of style in this Rixo dress. This brown and white combo takes inspiration from Abigail Spencer’s polka dot dress. And with a sartorial nod to Julia Roberts in Pretty Woman, enviable style is inevitable. The neckline structure matched with an asymmetrical hemline gives this dress the Amal Clooney effect. Be daring and break from the norm of wedding wear with a jumpsuit. The bardot neckline of this Warehouse piece adds femininity to the tailored look.